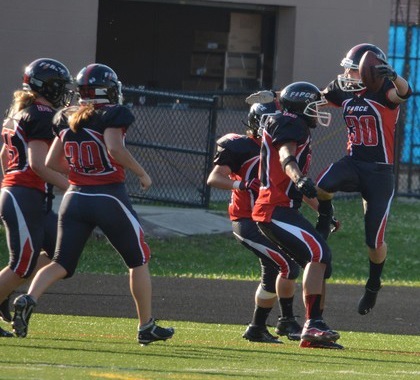 CHICAGO, IL Rachel Gore did it on the ground and by air, leading the host Chicago Force to a 71-12 playoff victory over the Cleveland Fusion on June 27 at Lane Stadium on the campus of Lane Tech High School. 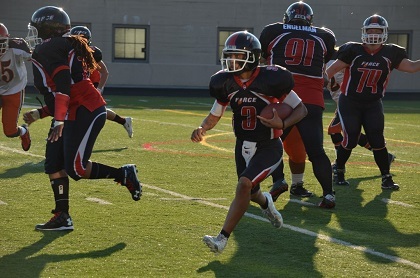 The Force quarterback threw for 176 yards and three touchdown passes, including a 62-yard first quarter strike to Jeanette Gray as Chicago built a 34-0 lead at halftime. Gore also ran for 157 yards and rushed in for three touchdowns. Gore was name the Game Day Offensive MVP, sponsored by Spin Nightclub and DLG Management — her second such award of the season. "It felt good," Gore said on the winning sidelines, minutes after the game. "We were sending a message, and this was a nice way to set the tone for the playoffs, especially since we are peaking at the right time." Elisha Okrey was the superstar on defense, grabbing the Game Day Defensive MVP award, also sponsored by Spin Nightclub and DLG Management. Okrey returned a first quarter interception for 70 yards and a touchdown, and then a third quarter interception was returned 40-yards for the TD. "I was able to make some in-game adjustments, and it seemed like wherever they lined up, we switched things up — and it worked," Gore said. "We manipulated them and just had answers for everything they did. "This really was a fun game, especially since it really was a team effort." 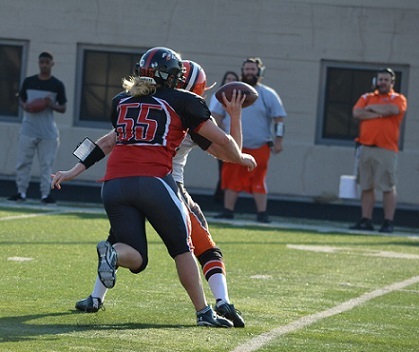 The Force led 64-0 after three quarters, and it wasn't until 10:22 of the fourth when the Fusion scored. Chicago will next travel to Boston for its second-round playoff game on July 11. For more information please visit chicagoforcefootball.com or call the Force ticket line at 312-371-7813. Read the original Windy City Times article here.